Easter in Crete and Greece as a whole is celebrated in a different manner to what we have become accustomed to at home. The date of Greek Easter changes every year and sometimes coincides with the the rest of Europe but sometimes differs. 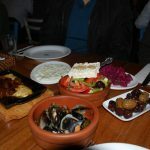 Rather than spending Easter at home why not take your family on a holiday to Crete and enjoy Easter In Crete which is much more magical than a normal Easter at home. Crete in April has better weather than here in the UK and any family run hotel will make you feel part of the celebrations and probably even invite you over to share in the mid afternoon roast. Many of the traditions that bond the generations together occur during the Easter feast. Easter is the most sacred and celebrated of all of the Greek holidays. The Cretan and Greek people are much more family orientated than most other cultures but at Easter it really shows. For the tourist its a marvel to watch, the massive bonfires in the town centres, firework displays, lamb roasting on open spits. 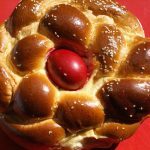 Spending Easter in Crete is amazing, get along with the locals and join them in the celebrations, get your red Easter egg and some Easter bread and dine on traditional lamb dishes fresh from the BBQ. One of the most popular and well known areas of Greek Easter has to be the Easter Egg which is associated with beliefs dating back to ancient times. The egg was an important symbol in the mythologies of many early civilizations, including those of India and Egypt. It was commonly believed that the universe developed from a great egg and that the halves of its shell corresponded to Heaven and earth ring. Greeks mainly colour eggs red (scarlet) to signify the blood of Christ. 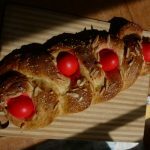 They use hard-boiled eggs (painted red on Holy Thursday) which are baked into twisted sweet-bread loaves or distributed on Easter Sunday; people rap their eggs against their friend’s eggs and the owner of the last un cracked egg is considered lucky. April is normally a quiet time for the locals, but you will still find them as friendly as ever and in our opinion its the best time to visit the island and get an in sight into the real culture of Crete. 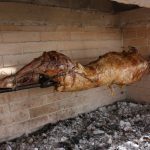 If you get a chance to celebrate Easter in Crete, do not pass it up; it will mean song, dance and “Kefl” around the fire pit as the spit slowly revolves cooking the lamb. The most important thing to take away from Greek Easter is the family orientated celebrations. 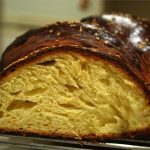 This year make sure you spend more time getting your family together, even go as far as making the Greek Easter eggs or bread that we offer recipes on. According to Greek Orthodox tradition, every day of the year is dedicated to a Christian saint or martyr. This is what is called a name day in Greece. For example, January 7th is the day of Saint John the Baptist and it is the name day for all Greek people named Yannis (or Ioannis = John, male) or Yanna (or Ioanna, female). A person’s Name Day is considered more important than the same person’s Birthday and it is always celebrated in Greece. How do Greek people celebrate their name days. If a friend of yours has his name day, then you should give him a call and wish him “Hronia Polla”. If this is translated, then it means “Many Years” and it is a wish for good health and prosperity. You should ask him if he will accept visits at his house to celebrate his name day. For birthday parties people invite their friends to their house for a drink or a birthday party but for name days this does not apply. It is up to you to visit your friend and wish him for his name day. Bringing a gift is necessary. Flowers or liquor are ok, as well as books, music CDs or something more personal. There is a list of the most common names and the days these are celebrated on. Every Greek is aware of these days, past down through the years and will always be aware of their friends and family. Below you will find a list of the most popular Greek names and the date that their name day falls on. This is by no means a fully comprehensive list but it does cover the main names you will hear on a daily basis in Crete and Greece. April 23 – Georgios (Yorgos) – Georgia. If this name day is during the Easter Lent, then it is moved to the 2nd day after Easter.